This play is about normal people – a normal mother with a bit of a theatrical streak to her character with which she guilts her sons into doing what’s best for them. A normal mother, just like mine. It’s also about her son, who writes the play in order to have the pleasure of seeing her again, of hearing her again after she died a cruel and too early death. And both Lucy Peacock and Tom Rooney are fantastic in it. Rooney fills the thankless job of feeding “Nana” cues, replying to her diatribes and of clueing the audience in to yet another couple of years that have passed with soul and understanding while he changes from the 10 year old boy to the 22 year old man who all of a sudden sees the roles exchanged. Now he has to be Nana’s rock while she is embarking on her last journey. Lucy Peacock is outstanding – her monologues resonate through the hearts of the audience, first in a very comical, later in a tragic, lost way of dealing with the daily “stuff” of children, sisters in law, neighbours, television stars and life in general, all the while making up stories to better cope with the sometimes bleak realities of life. Nana herself is born for the stage – or is portrayed that way by her son Michel Tremblay – but will never have the opportunity to realise her underlying ambitions. It is very telling that she confides in her son that for her actors only exist as long they are on television. For her it is impossible to picture them driving home, cleaning the kitchen or fixing lunch. They lead a life so much more magical than hers will ever be. (And it is her son that for the first time brings plays on stage with people who “speak like people” – ironic, that his mother never saw his success she had a major part in sparking off. Because as much this play is about life and death it is also about the situation of women in the late 50ies in Quebec – a life still very much dominated by the church and the belief that a woman was supposed to get married, stay married and have children; a life very much lacking the exaggerated events Nana makes up to illustrate her fears and insecurities, her emptiness and her sadness. It is finally when she is already in very much pain from a never disclosed cancer that she stops making up “scenes” to cope. It is then she actually speaks in plain language and it is also then her son takes over to adopt her theatrics and brings her back to her childhood memories to ease her into a different birth – the birth of death. Lucy Peacock – according to the wonderful Dr Kim Solga who interviewed the actress shortly before she did a lecture on the play in Stratford – she likened the work on and with a play with giving birth to a child – as much as Nana likens the cancer eating at her and the pain it causes with the pains of childbirth. Peacock herself explained that the labour of developing a play and then performing it is very much the same as childbirth as during all this one is prone to say: WHY am I doing this to me??? while afterwards one admits: But it was so worth it! And worth it is – he play is absolutely brilliant on the minimalistic stage of the Tom Patterson Theatre, both Peacock and Rooney deserve the standing ovation and the audience is well advised to bring hankies as the play ends on a very intense high note. 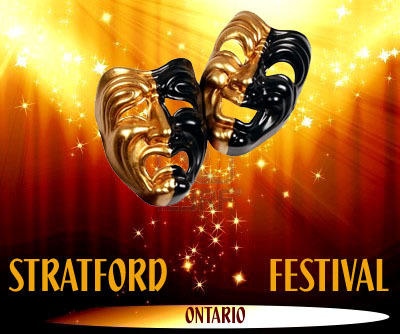 This entry was posted in Stratford Festival Ontario and tagged For the pleasure, Lucy Peacock, Michel Tremblay, Tom Patterson Theatre, tom rooney. Bookmark the permalink.